Mozart - Six Viennese Sonatinas (Piano With a CD of Performances Book/CD). By Christopher Harding. By Wolfgang Amadeus Mozart (1756-1791). Edited by Christopher Harding. For Piano. Schirmer Performance Editions. Softcover with CD. 72 pages. Published by G. Schirmer (HL.296785).ISBN 1423483057. 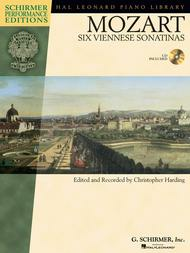 9x12 inches.The engaging yet simple Viennese sonatinas have been part of standard piano literature since soon after Mozart's death. This new edition provides helpful, practical direction for playing in the Classical style and an excellent recording by the editor. Intermediate Level.